La Taupinere is a very comfortable and well-equipped, private, individual chalet. It has a large balcony facing south to wonderful views of the mountains and alpine meadows. The detached chalet is surrounded by its own garden. La Taupiniere also has a large sauna and private, indoor, 30ft heated swimming pool. The pool room has floor to ceiling glass doors/windows for lovely views onto the garden and mountains. La Taupiniere also has the benefit of excellent wifi internet connection. The chalet is in a superb and beautiful location for all mountain activities including skiing, mountain biking, walking, golf, para-gliding, tennis or just for relaxing. It is well located for easy access to Lake Leman (Geneva) with its attractive lakeside towns of Vevey, Montreux, Lausanne etc. or the beautiful villages of the White Mountains: Chateau d'Oex, Gstaad, Rougement, or the glacier at Les Diablerets. The village is surrounded by farms, with cows grazing in summer, producing the milk for the famous Gruyeres Cheese and the truly delicious Cailler chocolate, made and sold in nearby Broc, where you can also visit the factory. It is also possible to visit the Gruyeres Cheese factory and/or surrounding farms to see how the cheese is made. Gruyeres is a delightful area to spend time, whether active or relaxing. The area is renowned for its beauty and there is plenty to see and do, both summer and winter. Moleson village has a small food store, restaurant, and cafe. The village is popular for skiing, has a friendly tourist office and a ski school. 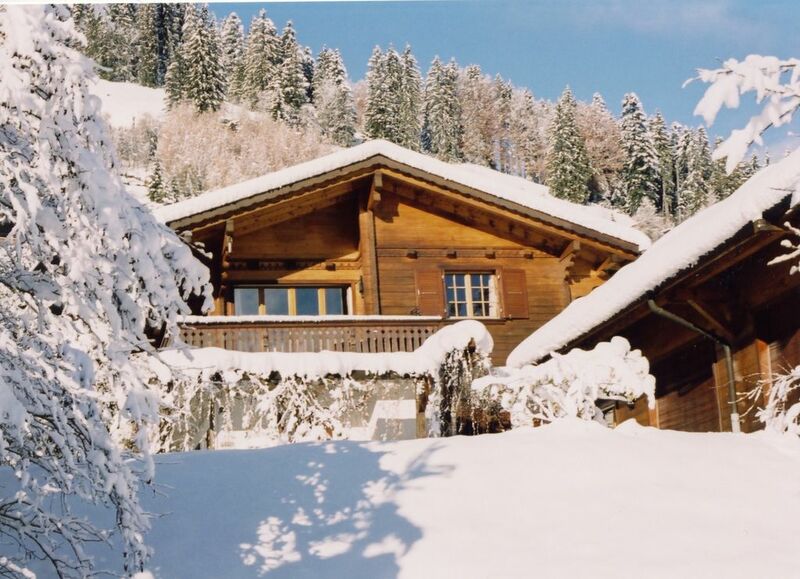 The rental price includes the use of the chalet for up to 9 adults, and all the bed linen, bath towels and electricity. Swiss tourist tax is extra at CHF2.75 per person, per night. I now manage the chalet on behalf of my mother, who purchased Chalet La Taupiniere in 1988. We had previously owned another chalet in the village since 1978. So I have grown up holidaying in Moleson and we really love both the chalet and the area. My parents jumped at the chance to buy La Taupiniere as it had the fabulous indoor swimming pool and more space. Unlike most chalets in Moleson the parking is right outside, on flat ground, and there are no steps to the chalet. It is also situated in a very quiet no-through road with just 8 other chalets and there are open fields to the front, so it's very peaceful. As it's been our holiday home for so long, it really is a 'home' - well equipped, nicely furnished and the little touches and details that lift the chalet from being a mere 'soulless rental' to a homely base for your holiday. I love being in a lovely little village in the mountains, yet it is so easy to get into the main town of Bulle and to other places in Switzerland. Compared to many ski chalets that are a long way up a mountain, where it's nigh-on impossible to leave once there, Moleson is really well located. So whether you want more skiing, restaurants, supermarkets, the tourist attractions of Gruyeres and the area, or the larger cities of Fribourg, Bern and Geneva - it's all really easy to access. A really great year-round holiday home. shower, A large shower for before/after swims. Also a large sauna. On the lower ground floor, alongside the bedrooms, there is a main bathroom with double washbasins and a large bath with a fabulous large rain shower over. This bathroom also has electric underfloor heating. There is a separate WC next to this bathroom. The pool room has a large shower enclosure as well. There is a WC and hand basin upstairs, next to the single bedroom. This bedroom also has a large wash basin. The annexe double bedroom has an en-suite shower room with underfloor heating. Quality cotton bed linen is provided for each bed. We have feather pillows and duvets but a limited number of non-feather bedding is available for allergy sufferers. Free wireless internet which is up to 50mbps download and 10mbps upload, with a brand new router with Swisscom's latest technology for stable, fast internet. La Taupiniere has super-soft, eco-friendly bamboo/cotton towels. We have a large bath sheet (100cm x 150cm) and a smaller towel (70cm x 130cm) for each guest. A 30ft heated indoor swimming pool and large sauna. The pool is fully automatic and is heated by an eco-friendly air-source heat pump for 9 months of the year and PV solar panels. There is a large and comfortable corner sofa, seating 5 people, and another 3-seater sofa. There is also some bench seating for 3 people next to the fire place. There is a coffee table in the middle. There are loads of plates, bowls, serving dishes, pans, utensils and the kitchen is very well-equipped. The kitchen has a large fridge-freezer, oven, hob & dishwasher. There is a microwave, kettle & toaster, as well as a food mixer, fondue set, & plenty of pots, pans, dishes, crockery & cutlery. The dining area is open plan with the sitting area. The extendable dining table seats 8 people comfortably and easily seats 10 plus when extended. A speaker dock for your iPod/MP3 player/smartphone - perfect for your music collection, Spotify etc. There is also a digital DAB radio. There are a few book cases dotted around the chalet with a variety of novels, non-fiction and guides. There are also children's books. A large trunk of board games, cards and plenty of games and toys for children and grown-ups. The garden wraps all around the house and is a lovely play area for children, or a private area to enjoy the sun. In winter it provides a fun sledging area. The wrap-around balcony leads from the front door around to the dining/living area, which is accessed via large bi-fold glass doors. There is a small table & some chairs - ideal for al fresco eating. The terrace faces south and east & is in a lovely sheltered spot next to the chalet - a real sun-trap. There is a wooden pergola over with Virginia creeper, providing welcome dappled shade in summer. The ski slopes are just 500m away. There is a nursery slope with tow lift. A funicular railway then accesses the main slopes. There is a ski school too. There is a ski rack outside the front door. The large sauna can have three adults lying flat or up to 8 people sitting. A 30ft indoor heated pool is a lovely luxury. There are seats & recliners around the pool. The water is around 28c all year. Full height glass windows/doors on to the garden with mountain views. Holiday in a Winter Wonderland! We loved the house the moment we arrived - it is small but very spacious and well stocked. The kids loved the pool. Everybody found their spot in the house and was able to enjoy it to the fullest. The proximity to the slopes is a big plus with the children - when they are tired you are home in 5 Minutes. We loved the house and Moleson and would recommend it for Families. Thank you for your lovely review. I'm glad you enjoyed your stay at La Taupiniere and I hope to be able to welcome you again one day. La Taupiniere is located in the small alpine village of Moléson-sur-Gruyeres, surrounded by pastures, yet only 15km away from the N12 Autoroute. Geneva is about 70 miles/125km away, and Airport & Palexpo (exhibition centre) is 75 minutes by road. Nearby are other small village resorts, such as Charmey, La Berra and Les Paccots. The advantage of these villages for skiing are that they are cheaper and far less crowded than the well-known resorts. Within an hours drive (and some a lot nearer) are the internationally-known ski resorts of Verbier, Villars, Les Diablerets, Leysin, Gstaad, Chateau d'Oex, Murren & Wengen, as well as many other, smaller resorts. Summer: La Taupiniere and Moleson are ideally located for summer activities - be it walking, hiking, summer activities, scenic drives etc.